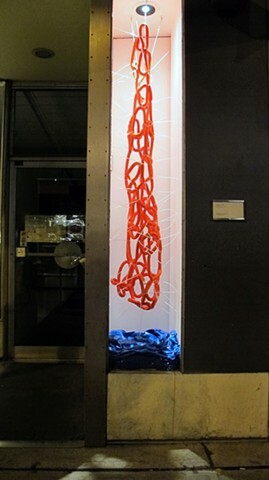 Leifar, (Polypropylene rope, cable ties, blue tarp; 250x60x48cm). Leifar/Remants was presented at *Queen Specific Gallery, Toronto ON in fall/winter 2012. The street front window space was curated by Jennifer Simaitis and Stephan Hancherow.